Group C nerve fibers are one of three classes of nerve fiber in the central nervous system and peripheral nervous system. The C group fibers are unmyelinated and have a small diameter and low conduction velocity. They include Postganglionic fibers in the autonomic nervous system (ANS), and nerve fibers at the dorsal roots (IV fiber). These fibers carry sensory information. Damage or injury to nerve fibers causes neuropathic pain. Capsaicin activates C fibers Vanilloid receptors, giving chili peppers a hot sensation. C fiber axons are grouped together into what is known as Remak bundles. These occur when an unmyelinated Schwann cell bundles the axons close together by surrounding them. The Schwann cell keeps them from touching each other by squeezing its cytoplasm between the axons. The condition of Remak bundles varies with age. The number of C fiber axons in each Remak bundle varies with location. 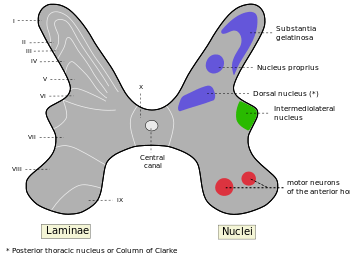 For example, in a rat model, large bundles of greater than 20 axons are found exiting the L5 dorsal root ganglion, while smaller bundles of average 3 axons are found in distal nerve segments. Multiple neurons contribute axons to the Remak bundle with an average ratio of about 2 axons contributed per bundle. The cross sectional area of a Remak bundle is proportional to the number of axons found inside it. Remak bundles in the distal peripheral nerve are clustered with other Remak bundles. The Remak Schwann cells have been shown to be electrochemically responsive to action potentials of the axons contained within them. Central sensitization of the dorsal horn neurons that is evoked from C fiber activity is responsible for temporal summation of “second pain” (TSSP). This event is called ‘windup’ and relies on a frequency greater or equal to 0.33Hz of the stimulus. Windup is associated with chronic pain and central sensitization. This minimum frequency was determined experimentally by comparing healthy patient fMRI’s when subjected to varying frequencies of heat pulses. The fMRI maps show common areas activated by the TSSP responses which include contralateral thalamus (THAL), S1, bilateral S2, anterior and posterior insula (INS), mid-anterior cingulate cortex (ACC), and supplemental motor areas (SMA). TSSP events are also associated with other regions of the brain that process functions such as somatosensory processing, pain perception and modulation, cognition, pre-motor activity in the cortex. Unfortunately, interpretation of the microneurographic readings can be difficult because axonal membrane potential can not be determined from this method. A supplemental method used to better understand these readings involves examining recordings of post-spike excitability and shifts in latency; these features are associated with changes in membrane potential of unmyelinated axons like C fibers. Moalem-Taylor et al. experimentally used chemical modulators with known effects on membrane potential to study the post-spike super-excitability of C fibers. The researchers found three resulting events. Chemical medulators can produce a combination of loss of super-excitability along with increased axonal excitability, indicating membrane depolarization. Secondly, membrane hyperpolarization can result from a blockade of axonal hyperpolarization-activated current. Lastly, a non-specific increase in surface charge and a change in the voltage-dependent activation of sodium channels results from the application of calcium. 1 2 3 4 5 6 7 8 9 10 11 12 13 14 15 16 17 Purves, Dale; et.al (2004). Neuroscience. Massachusetts: Sinauer Associates, Inc. ISBN 0-87893-725-0. ↑ Craig, AD (Aug 2002). "How do you feel? Interoception: the sense of the physiological condition of the body". Nature Reviews Neuroscience. 3 (8): 655–66. doi:10.1038/nrn894. PMID 12154366. 1 2 3 4 5 6 7 8 9 10 11 12 13 Murinson, BB; JW Griffin (2004). "C-fiber structure varies with location in peripheral nerve". Journal of Neuropathology and Experimental Neurology. 63 (3): 246–254. PMID 15055448. 1 2 3 Fagan, Tom (2003). "Glial Cells Critical for Peripheral Nervous System Health". News from Harvard Medical, Dental and Public Health Schools. 1 2 3 4 5 6 7 8 9 10 11 12 13 14 Baron, Ralf (2006). "Mechanisms of Disease: neuropathic pain—a clinical perspective". Nature Clinical Practice Neurology. 2: 95–106. doi:10.1038/ncpneuro0113. ISSN 1745-834X. 1 2 Chung, J.M. ; et. al (1979). "Excitation of primate spinothalamic neurons by cutaneous C-fiber volleys". Journal of Neurophysiology. 42: 1354–1369. 1 2 3 4 5 6 Craig, AD (2003). "Interoception: the sense of the physiological condition of the body". Current Opinion in Neurobiology. 13 (4): 500–505. doi:10.1016/S0959-4388(03)00090-4. PMID 12965300. 1 2 Loken, L (2009). "Coding of pleasant touch by unmyelinated afferents in humans.". Nature Neuroscience. 12 (5): 548–549. doi:10.1038/nn.2312. PMID 19363489. 1 2 Davis, JB; et. al (2000). "Vanilloid receptor-1 is essential for inflammatory thermal hyperalgesia". Nature. 405 (6783): 183–7. doi:10.1038/35012076. PMID 10821274. 1 2 3 4 5 6 7 8 9 10 Scholz, Joachim; Clifford Woolf (2002). "Can we conquer pain?". Nature Neuroscience. 5: 1062–1067. doi:10.1038/nn942. PMID 12403987. ↑ Baron, Ralph; Ogawa, Setsuro; Katz, Joel; Nagai, Hitoshi; Kashiwazaki, Miho; Saeki, Shigeru; Suzuki, Hajime (2000). "Peripheral neuropathic pain: from mechanisms to symptoms". Clinical Journal of Pain. 16 (2 Suppl): S12–20. doi:10.1097/00002508-200003000-00003. PMID 10870735. 1 2 Lai, J; Hunter, John C; Porreca, Frank (2003). "The role of voltage-gated sodium channels in neuropathic pain". Current Opinion in Neurobiology. 13 (3): 291–297. doi:10.1016/S0959-4388(03)00074-6. 1 2 3 4 5 6 Staud, Roland; et. al (2007). "Brain activity related to temporal summation of C-fiber evoked pain". Pain (1-2 ed.). 129 (1–2): 130–142. doi:10.1016/j.pain.2006.10.010. PMC 1997296 . PMID 17156923. 1 2 3 4 5 Mano, Tadaaki; et. al (2006). "Microneurography as a tool in clinical neurophysiology to investigate peripheral neural traffic in humans". Clinical Neurophysiology. 117 (11): 2357–2384. doi:10.1016/j.clinph.2006.06.002. PMID 16904937. 1 2 3 4 5 6 7 Moalem-Taylor, Gila; et. al (2007). "Post-spike excitability indicates changes in membrane potential of isolated c-fibers". Muscle and Nerve. 36 (2): 172–182. doi:10.1002/mus.20793. PMID 17487863.